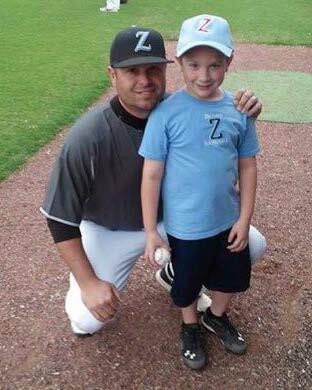 The Zachary High baseball team hosted their annual Cystic Fibrosis game on Thursday, April 17th vs. Central High. In lieu of admission charges to the game, donations were collected for the Cystic Fibrosis Foundation. Thanks to generous givers, a total of $907 in donations was collected during the game. Cystic Fibrosis is a genetic disease, with no cure, that mainly affects the respiratory and digestive systems. Shown in this picture with Coach Jesse Cassard is Rhyan Rosenbach. Rhyan, who was diagnosed with CF at birth, threw out the first pitch of the game. He is a kindergarten student at Northwestern Elementary School and is the son of Brian Rosenbach and Kati Simmons.